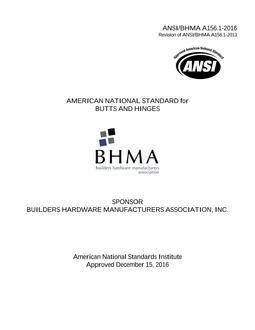 ANSI/BHMA A156.15 covers requirements that apply to door closers combined with hold-open devices or free-swinging door closers combined with releasing devices and includes performance tests covering operational and strength criteria. Changes made to this version of A156.15 included improving the format to make the test sequences easier to follow, as well as specific changes to the Closing Force Test and how to test Free Swinging Release Devices. This Standard is useful to architects, engineers, building owners, installation and maintenance personnel and anyone else concerned with the proper operation of release devices.